Full second edition now available with new material and analysis on removal powers, appeals provisions, administrative review, health surcharge and more. Links to relevant Home Office guidance now included. The Immigration Act 2014 is already having a profound impact on the lives of undocumented migrants and on anyone suspected of being undocumented: it is likely that the ethnic minority community in the UK will feel the effects of enhanced in-country immigration control measures as employers, universities and colleges, landlords, marriage registrars, banks, building societies, doctors and the DVLA attempt to implement their legal duties to single out and discriminate against undocumented migrants. The Act and the hostile environment it seeks to create will affect everyone, though. In theory, any person renting a private property in future will need to prove their immigration status to their landlord or agent. Any person opening a bank account will need to prove their immigration status as well as their identity. The notice period for all marriages will be extended from 15 days to 28 days. For immigration lawyers the effects are profound. The Government has predicted a 67% fall in the number of immigration appeals. This may be an overestimate and it may well be counterbalanced to some extent by an increase in applications for judicial review, but it will nonetheless have an important impact on the everyday work of lawyers. These appeals provisions took full effect on 6 April 2015. And the major changes are not confined only to appeal rights. This ebook runs through the Act section by section, providing an explanation of the changes made, setting out amended versions of relevant legal provisions and explaining commencement provisions. Where relevant links to legislation, cases and Home Office policy documents have been included in the text. The first part examines the new removal power under the new section 10 of the 1999 Act and its implications, before moving on to removal and detention involving children and families and new provisions on enforcement, bail, biometrics and detention. The Government has predicted a 67% fall in the number of immigration appeals. The second part looks at appeals. I examine and set out the new rights and grounds of appeal, the problems that arise and analyse how the human rights jurisdiction might be used to argue that cases that would previously have succeeded under the abolished ‘not in accordance with the immigration rules’ or on ‘not in accordance with the law’ grounds. This section also looks at the expansion of administrative review, the new provisions on in and out of country appeals, on out of country appeals against deportation and at the controversial new statutory Article 8 considerations imposed on judges. The third part looks at the new duties on private landlords, banks and building societies and driving licenses as well as the NHS surcharge. The fourth part examines the new provisions on marriage and civil partnership and the scheme for reporting of sham marriages, which the Home Office estimates will lead to 35,000 referrals to the Home Office per year and 6,000 investigations. The fifth part briefly examines the new powers for the Office of the Immigration Services Commissioner and changes to the OISC scheme. The sixth part looks in particular at changes to citizenship laws, some positive and some less so, as well as new provisions on the future setting of immigration fees. Already bought the first edition? Previous updates have been available to download for free for existing purchasers. 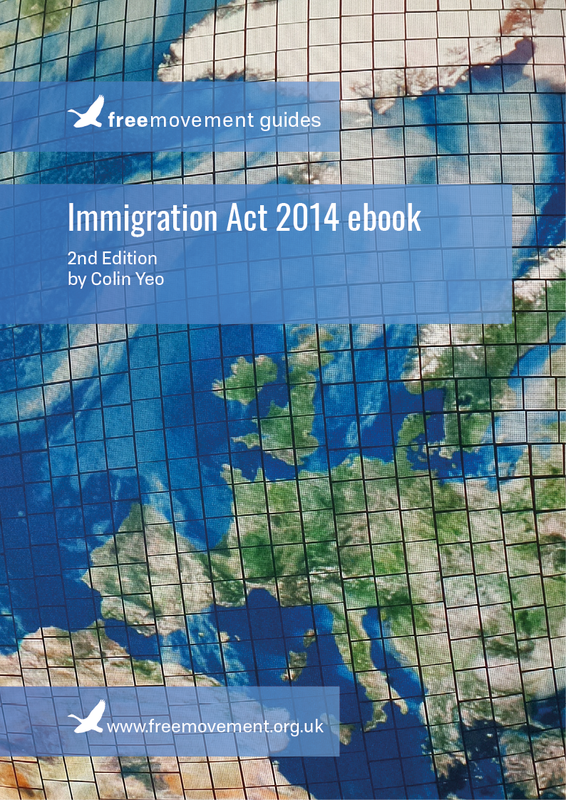 A great deal of work has gone into the latest update and this second edition will need to be purchased afresh if you are not a Free Movement Member. Existing purchasers of the 1st edition who set up an account can still download their previous purchase from here (log in and scroll to “your downloads”).